Homes this nice, backing to incredible open space, Sulphur Gulch Trail & within walking distance to Historic Olde Town Parker rarely come on the market. 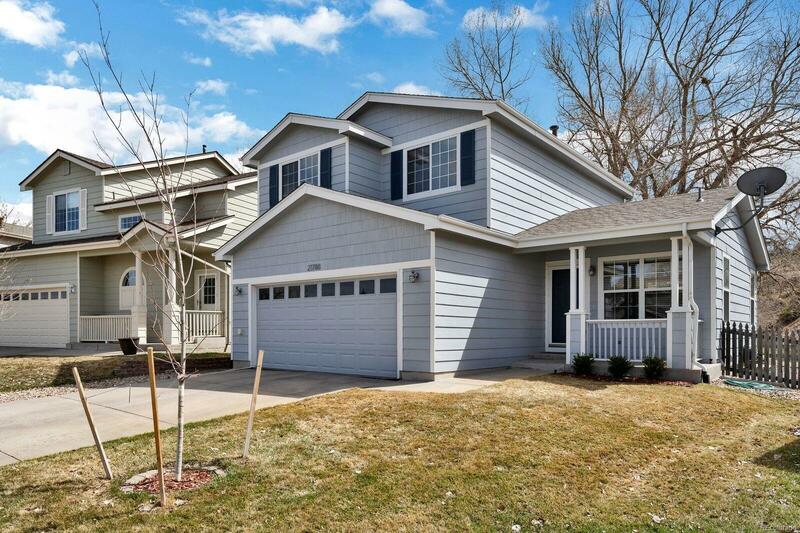 This remodeled 2 story features 3 bed + 2.5 bath. The lovely kitchen boasts quartz counter tops w/ subway tile backsplash, Samsung stainless steel appliance suite, solid hickory flooring, & large window to overlook the rear yard & open space. The warm & inviting family room features gas log fireplace & panoramic window to view the trees & open space. Owner's pride shows throughout this home w/ newer paint, tile floors, nickel finish led lighting. Upgraded roof & water heater. Now outside, mature trees, rear gate to trail. Relax on your flagstone patio as the sun sets over the Rockie Mtns. Short walk to Riva Ridge Park and Pioneer Elementary. HOA includes gorgeous Canterberry pool. Quiet country-like neighborhood w/ EZ access to schools+shopping+dining. EZ commute to DTC, DIA, Denver, C470, & Lone Tree. Don't miss out on this beauty.